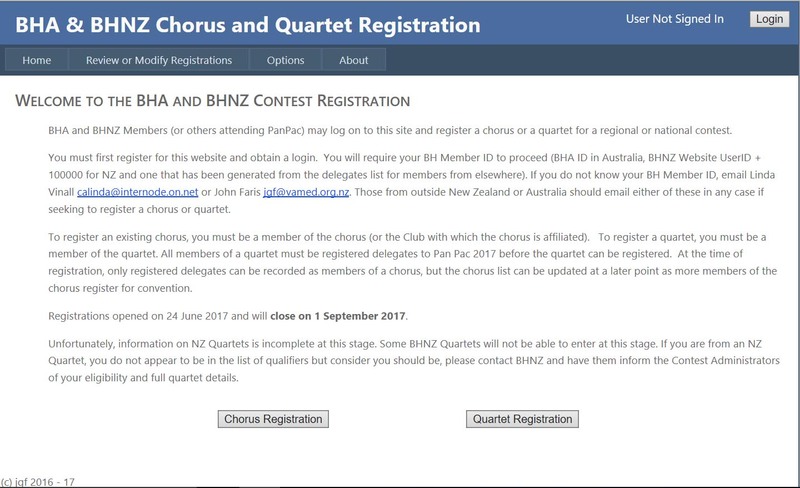 This website is used for quartets and choruses to register for BHA and BHNZ contests. Note that you pick the username and password. However, your surname, BH Membership ID and the email address registered with your BH membership must all match. For BHA members, the BH Membership ID is the BHA Member ID. For BHNZ members, it is the website UserID + 100000. For those from outside Australia or New Zealand, it will have been generated by the contests system and you will need to email the contest administrator and ask them for it. Complete the captcha – it is not case sensitive. Some competitions may include invitation ensembles (ie which is not registered with BHA or BHNZ). If such ensembles are able to enter the contest, it is likely neither the members of the ensemble nor the person wanting to register it will be on the contests website. If this is the case, they will need to contact the Contest Administrator before attempting to register on the website. For a chorus, only the name of the chorus and the name and email address for person wanting to register the chorus is required. 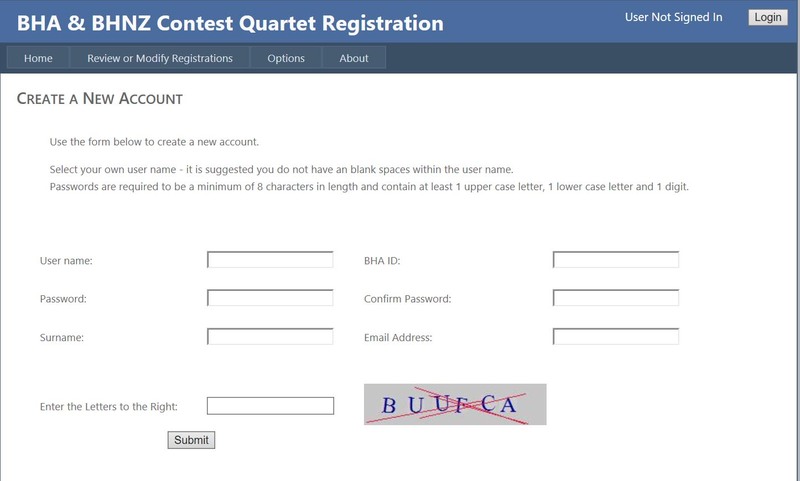 For a quartet, the name of the quartet, the names of the singers (but not singing parts) and the email address of the person wanting to register thequartet will need to have been provided. Usernames cannot contain spaces. Passwords must be at least 8 characters in length and contain at least one upper case letter , one lower case letter and a digit. The system has a limit on password length but any reasonable number of characters more than eight should be acceptable. You will go to a screen that tells you that you have been sent an email to allow you to complete the user account registration process. Click on the link in the email to do so. Once the account is established, go to the login screen and do so.